Get ready for the ultimate in contemporary dining sets. Modern and majestic with an industrial feel; this combination of Teak, #316 Stainless Steel, and Raw Concrete within the Tapered Leg Concrete Table and Chairs Set makes for a fabulous state of the art dining set that works brilliantly inside or out. 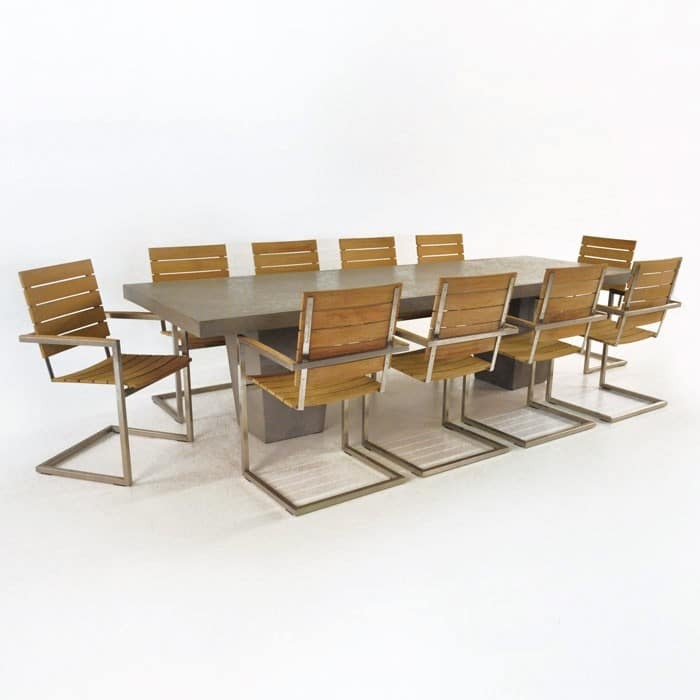 The Tapered Leg Concrete Table and Chairs Set is defined as a contemporary dining set because of the amazing blend of materials in a linear, structured design. 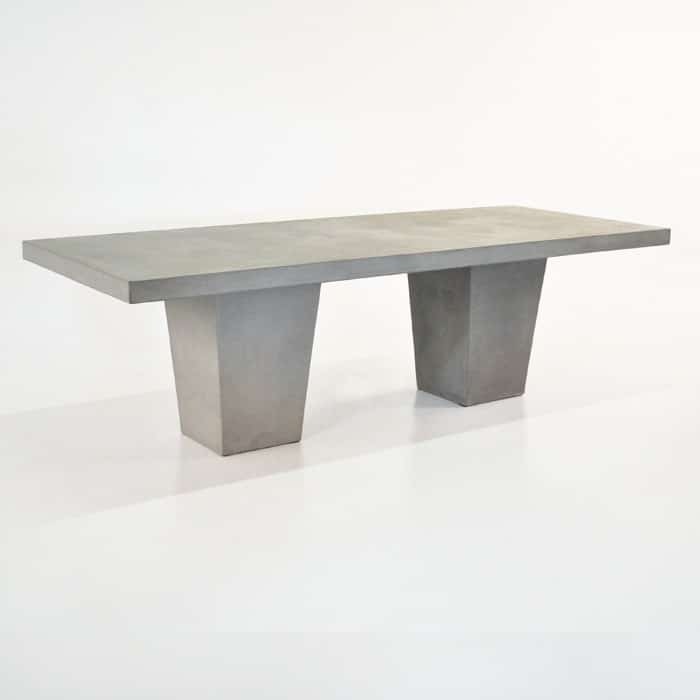 The Raw Concrete Tapered Tables are made from a composite concrete material, this one shown is 2.5 metres by 1 metre; seating up to 10 people. A huge solid rectangular slab makes the table top while the two legs are large tapered columns, giving a sense of stability within this heavy, magnificent piece. Get ready for the ultimate in contemporary dining sets. Modern and majestic with an industrial feel; this combination of Teak, #316 Stainless Steel, and Raw Concrete within the Tapered Leg Concrete Table and Chairs Set makes for a fabulous state of the art dining set that works brilliantly inside or out. 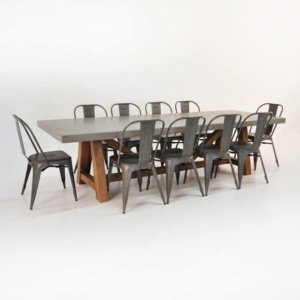 The Tapered Leg Concrete Table and Chairs Set is defined as a contemporary dining set because of the amazing blend of materials in a linear, structured design. 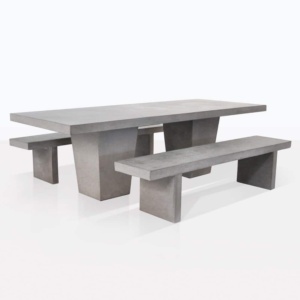 The Raw Concrete Tapered Tables are made from a composite concrete material, this one shown is 2.5 metres by 1 metre; seating up to 10 people. A huge solid rectangular slab makes the table top while the two legs are large tapered columns, giving a sense of stability within this heavy, magnificent piece. 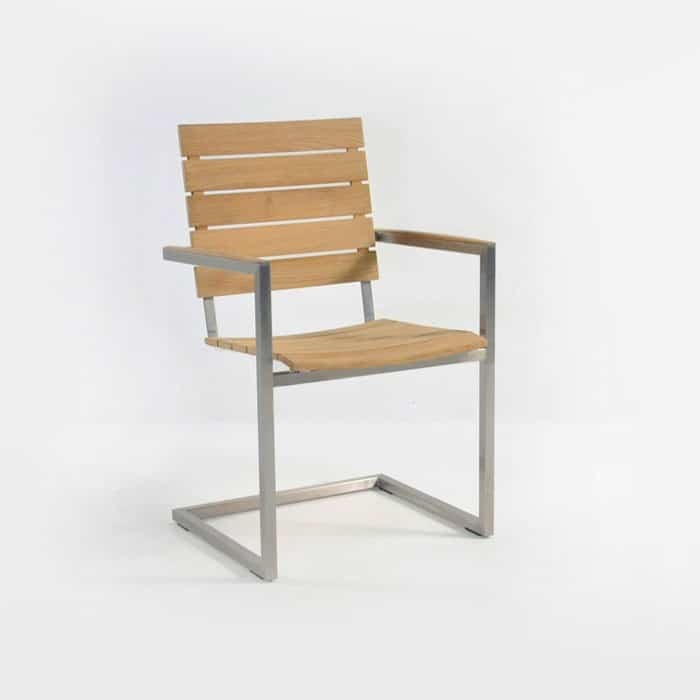 Complementing the grandeur of the table are 10 Bruno Teak Chairs; a comfortable and contemporary design, these chairs are a mixture of Grade A Teak and Stainless Steel. The stainless steel frame is shaped like a sleigh, which adds flavour to an already fabulous design, but also comfort! The sleigh allows the chair to have a gentle rocking quality that makes eating and entertaining outdoors a wonderful, calming experience. Our Raw Concrete is put together with resin and fibreglass, meaning that the material is stronger and lighter than a complete concrete item. 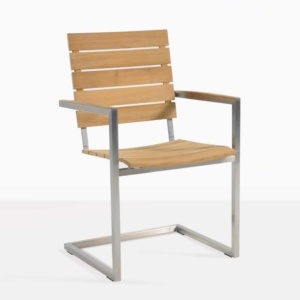 Rest up in the assurance that the stainless steel frame of your chairs are #316 – the top marine quality – this fabulous material won’t rust, it will simply need to be wiped or washed down from time to time to avoid any fingerprints or other marks! The back and set of the chair is beautiful slats of Grade A Teak. Brimming with natural oil as well as rubber, this is the best wood for outdoor furniture. There are no two ways about it. Do your research and you will agree. It is why we have been the top suppliers of outdoor furniture for over 20 years, because quality is everything. Try the Tapered Leg Concrete Table and Chairs Set within a similarly structured environment to capitalise on the modern feel of your space. This contemporary dining set will add style and a bit of swank to the area. Perhaps you want to break up a softer area, such as a garden or a deck with a view, place this contemporary dining set right in the middle and layer the table with raw concrete candles and votives. You’ll adore the upmarket feel of this exquisite set!